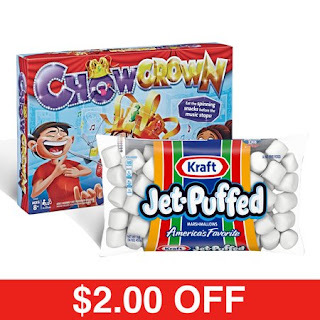 Grab this *POPULAR* Chow Crown Kids &amp; Family Game (Includes Marshmallows) $13.88. Looking for a fun and silly game that both adults and kids can enjoy? The Chow Crown game is the musical crown-spinning, chow-chompin' game for kids ages 8 and up and is a fun game for a kid's birthday party or birthday gift. Put on the crown then load the dangling forks with various food. (1 bag of Jet-Puffed Marshmallows, 16 oz Included) Ready? The crown will spin and play music -- and the challenge begins! In the Chow Crown electronic game, players try to bite off the food without using their hands, and aim to eat them all before the music stops. Want more of a challenge? Switch from the long game mode to the shorter game mode. The player who eats the most food wins. Who will be crowned chow champ?